Picking up on yet another unnecessary cliffhanger, Nick finishes the endless walk with his rolling luggage to arrive in the suite where the men are staying in New York City. He's greeted with silence and then questions about his intentions. Nick defends himself, explaining that yes he hung out with Andi, would've been at this show night one if he could've, and isn't chasing fame since he went back to work after the show. Nick even explains how his interest began and how there was some texting and Twitter talk beforehand, but then she got on the show. Nick understands the bitterness. Tanner is way too upset about this for a guy that has zero chance, and Joshua apparently doesn't like people getting second chances. 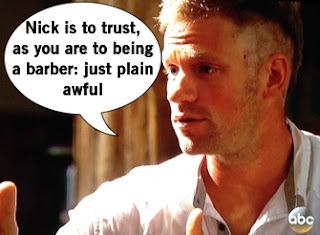 Fine Joshua, let's rip up your ticket for Bachelor in Paradise then. 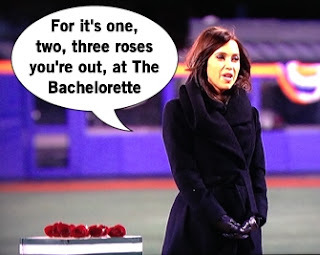 The cocktail party and rose ceremony is at Citi Field because hotels are so basic. JJ rounds all the bases with Kaitlyn the only way he'll be able to: carrying her and running around the baseball diamond. Tanner and Joshua use their time with Kaitlyn to complain about Nick. Shawn B. worries about the connection he's formed and being challenged, so Kaitlyn reassures him of their connection but he's all brooding and stuff. The guys really know how to make Kaitlyn feel like garbage at all times. Back down on the field, the rose ceremony finally happens while each guy voices over their bitterness at the possibility of Nick getting a rose over them. The guys who have to deal with that crushing blow are Corey, Ryan, and Jonathan. The remaining guys will put aside their New York state of mind and head down to San Antonio, Texas to the latest round of dates. Yee-haw. 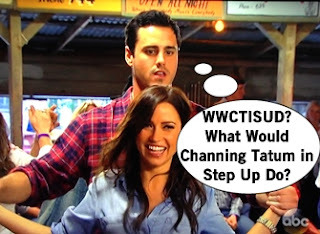 Ben H. and Kaitlyn are the first date of the week, driving in an old timey truck to enter a two step dancing competition at the oldest dance hall in Texas. They're the perfect fashion pair to start with, Kaitlyn in chambray and Ben H in a red flannel, serving up Footloose realness. The locals from the small town explain how dancing is like a relationship, because everyone in the world is full of corny metaphors for love and relationships. Kaitlyn is a natural since she's a dance instructor, while you can see Ben thinking out every single step as he licks his lips incessantly. The integrity of the competition isn't compromised too much, eliminating the couple in the second round. Later they share a romantic lantern-lit dinner of a rooftop where they talk about Ben H's difficulty opening up to someone he's dated for barely a month while competing against 24 other guys. Yes it's hard for him but he's into Kaitlyn and ready for love, so she gives him a rose. A twelve year old boy serenade Kaitlyn with his mariachi tunes (he also appeared on America's Got Talent, my mom wants you to know), before telling the group date guys what they'll be doing all day. Because murdering rap music wasn't enough, the group date guys will now write and perform mariachi songs about their love for Kaitlyn. I can't focus on the songwriting because I'm distracted by the restaurant's mural featuring dog whisperer Cesar Millan. What the hell is happening? Decked out in full mariachi gear, each guy gets up and performs for Kaitlyn accompanied by the band and gawked at by Bachelor Nation. Nick one-ups everyone and brings Kaitlyn up onto the balcony for a serenading, which includes rhyming "connection" with "erection" and therefore winning my heart with humor. The other guys of course resent all of this, well mostly Joshua who is such a poor sport about this whole thing for, again, a guy with zero chance. The group date migrates to a rustic ranch for drinks and chatting. Joshua needs a haircut and entrusts Kaitlyn to be his barber, which is a disaster because she's a dance instructor not a barber. As a girl who ruined a guy's haircut once from this same attempt at trust, I know you should always go to a professional. The haircut only distracts Joshua for a few minutes before he continues moaning about and confronting Nick. Unable to STFU, Joshua gets a second chance at alone time with Kaitlyn and uses the time to complain about Nick. Joshua really doesn't understand good date discussion topics. When Joshua mentions that no one in the house likes Nick, Kaitlyn then thinks everyone in the house has been lying to her face, leaving her to be a fool. Joshua has a "sheeeeeeit" moment of being the tattle tale. Kaitlyn confronts the guys about the potential lack of honesty, then Joshua changes his tune once in front of his bros. The guys don't have Joshua's back and are tired of rehashing the I-hate-Nick conversation again and again, not to mention they don't appreciate Joshua lying about them. 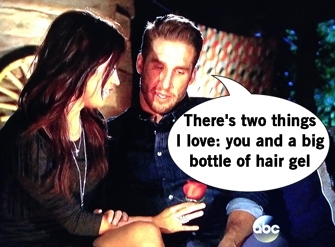 Nick got the rose because he actually used his time to makeout and be honest with Kaitlyn. Sorry 'bout it Josh. The last date of the week has Kaitlyn and Shawn B. kayaking down the River Walk. Shawn B. uses his time to defend Josh, saying he was trying to do the right thing and the other guys didn't want to stick their neck out. The date quickly moves to nighttime for snuggling and talking. Shawn B. shares a person story that he survived a massive car crash. "I'm falling in love with you," he says on like their maybe third date ever. 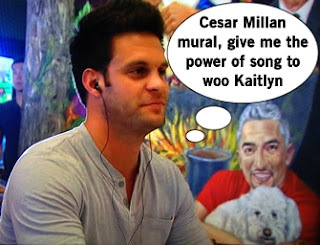 But then Kaitlyn whispers, "I feel the same way" which is a pretty big deal on this show. I get that there's an instant connection, but man watching them together on TV is paint drying. It's probably why all their dates are maybe seven minutes on screen. He gets a rose, then they paddle a canoe while being entertained by fireworks. 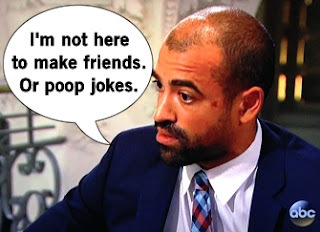 There's more moping in the guys coming from Ian, who can't believe Kaitlyn into instantly in love with a Princeton grad who survived a car crash. Ian doesn't find Kaitlyn interesting anymore, but DOES think he'd be an interesting Bachelor. We're all the star in our own minds, aren't we Ian? So at the cocktail party, Ian decides to make his grand exit so he can be memorable and maybe he'll become The Bachelor, or best case scenario a slot on Bachelor in Paradise. Well claiming your ex is hotter than the lead is always a great lead-in to win fans. So while Kaitlyn and Jared make-out after a "I'm falling in love with you" speech, then she makes out with Joe, Ian is droning on in voiceover about why he should be The Bachelor and be a gift that we unwrap for life. Hope you have a gift receipt. Since Kaitlyn values honesty, Ian decides to just go full-on Festivus and air his grievances. Ian isn't here for fart jokes, poop jokes, and movie quotes; he's here for deep love. 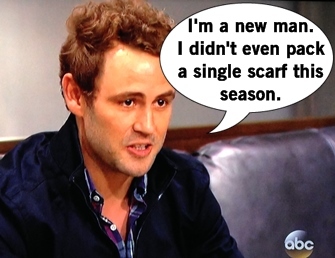 Ian wanted to date a wounded damsel-in-distress, not the brassy, confident, crass girl from night one. Oh and then he calls her out for being here to makeout with guys on TV and being shallow. LET HIM HAVE IT GURL. But next week because, of course, cliffhanger.